Niagara Falls is a world-renowned tourist destination because of, well, the really freaking big waterfalls there. Because of the monstrous falls a host of tourist traps, from casinos to mini-golf, have sprung up, to say nothing of industrial projects (mostly on the American side) that take advantage of the hydro-electric power generated by the mighty Niagara River. But I wasn’t there for the waterfalls or the casinos, and I definitely wasn’t there for the industry. No, I was there for the gulls. “Wait, who goes to Niagara Falls for the gulls?” you might be asking, and you are not alone. In fact, Canadian customs found my stated purpose for entering the country this past Saturday odd enough that they subjected my car to a very thorough search, delaying the start of my own search for gulls. 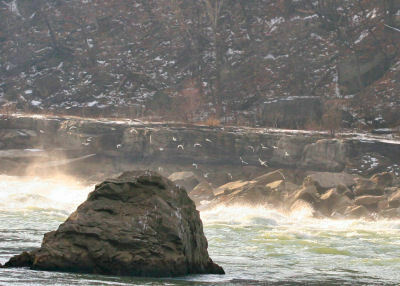 Believe it or not (readers or customs agents), the gigantic gorge carved over the eons by the Niagara River is known as one of the best spots in North America to see a wide variety of what are perhaps my least favorite birds. The end of November and beginning of December are when hoards of Bonaparte’s, Herring, Ring-billed and Great Black-backed Gulls descend on the river to feed off of the plentiful fish in the non-frozen river. Hidden among the throngs of more common gulls are treasures like Iceland, Franklin’s, Glaucous, Thayer’s, Little, Black-headed, Lesser Black-backed, California, and Slaty-backed Gulls, at least sometimes. A twist to the gulling, for me anyway, was that I wanted to see gulls in New York State to add to my Big Year list but the best views of and access to the gorge are on the Canadian side (hence my run-in with Canadian customs). Fortunately, if the bird is in New York one can see it from anywhere and still count it on one’s New York State list. The esoteric aspects of listing are fascinating, aren’t they? Mike’s spotting scope certainly came in handy as I carefully examined each and every gathering of gulls for rarities without having any luck. 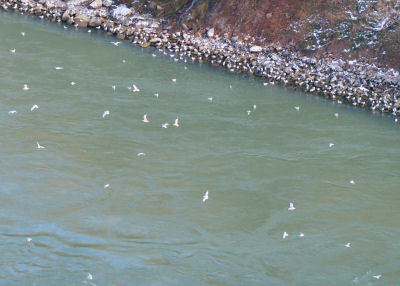 But I spotted fishermen fishing from shore at the whirlpool and decided to find my way down to the gorge-floor and examine some of the gulls up close. The hike down was, um, slippery. Imagine hiking down a very steep slope. Now add ice and snow. And carry a pair of binoculars, a camera, and a borrowed spotting scope. Fun it wasn’t but rewarding it was. The whirlpool was loaded with Bonaparte’s Gulls and my first rarity of the day, a first-year Lesser Black-backed Gull gave decent but distant looks in flight, circling the whirlpool a couple of times before disappearing (I never would have identified it if I hadn’t had a good lesson on the pelagic). Then I hiked back up out of the gorge and continued to my next major stop, the Sir Adam Beck Power Station. The power station is known as a great spot for congregations of bigger gulls, apparently because the hydro-electric aspect of the power generation leads to fish deaths (can anyone confirm this? ), which means food for the gulls. Herring Gulls outnumbered everything else at this spot on the river though Bonaparte’s Gulls were around in decent numbers and there was a sprinkling of Great Black-backed Gulls. A single first-winter Iceland Gull was perched amid the Herring Gulls on the New York side, a nice bird but what I really wanted was a Glaucous Gull, a larger white-winged larid. So I scanned and I scanned and I scanned and picked out a gull with white wing tips in flight. I tracked it, trying to get any other field mark, but it disappeared upriver. Then I looked back at where the Iceland Gull had been and it was gone so I can only assume it was the same bird. But there were always more gulls to look at so I kept scanning the birds in flight as I had already exhausted the birds that were resting on rocks. I spotted another white-winged gull, with wonderfully white wing-tips that was at least the same size as the Herring Gulls with which it was flying. The white wings indicated to me that it could either be an Iceland Gull or a Glaucous Gull but the size, and the clean whiteness of the wingtips, made it a Glaucous Gull (A side note here: When I first saw the bird it was flying over the New York side of the river but by the time I was sure of the ID it was on the Canadian side. I did not see it return to the New York side. I’m counting it on my New York list anyway). With more scanning I spotted a bird that could have been a another Lesser Black-backed Gull but I didn’t really concentrate on it too much as I was starting to get pretty darn cold and I was rather sick of gulls. I headed north along the river to Queenston where I stopped at the boat launch to look for more birds. 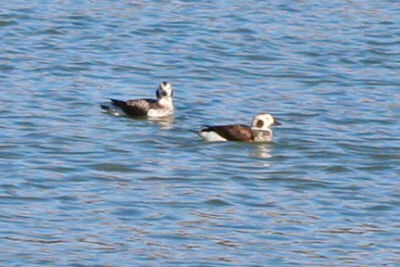 Other than the normal gulls flying over the river the only birds of interest were about thirty or so Long-tailed Ducks, two of which came in close enough to get a couple so-so shots. Then it was back up the river to cross back to New York. I explored both Fort Niagara at the mouth of the Niagara River and Goat Island between the American and Canadian falls but didn’t see anything particularly exciting. Sure, the White-winged Scoters, Red-throated Loon, Bufflehead, and Common Mergansers at the fort were nice and the American Black Duck and the American Black Duck X Mallard hybrid at Goat Island were nice but I was tired and cold, and had a four-hour plus drive back to Albany ahead of me so my heart wasn’t into it. Oh, and you might have noticed that I didn’t include any pictures of the falls in this post. There is a simple reason for that, and that is that the falls are so amazing, so spectacular, so awe-inspiring, that trying to photograph them is like trying to describe the Mona Lisa. You can try but it’s much better to just let people see for themselves. So go to Niagara Falls for both the falls and the gulls! Great story about the Glauc. I had the exact same thing happen to me this spring with a Common Black-Hawk that flushed on the US side and flew into Mexico. Wait, you still have that scope? I hope Mike’s charging rent. And now I’m very glad that I didn’t cross the border into Canada last April with 5 cases of wine in my back seat. @Nathan: yeah, no doubt I was counting the bird…but do I ever wish the bird I saw was a Common Black-Hawk. @Patrick: The rent Mike gets is his ability to live vicariously through his scope. I wonder if he can count birds his scope has seen? And man, who’d have thought Canadian customs would be more thorough than the Americans? Hahaha… you got searched by Canadian customs? They didn’t even look at my ID. So wish I could have been their with you guys! Although sorry they did a vehicle check . . . they normally are real good to us crossing over to watch the birds! We have even had some border control who were birders pass us through!